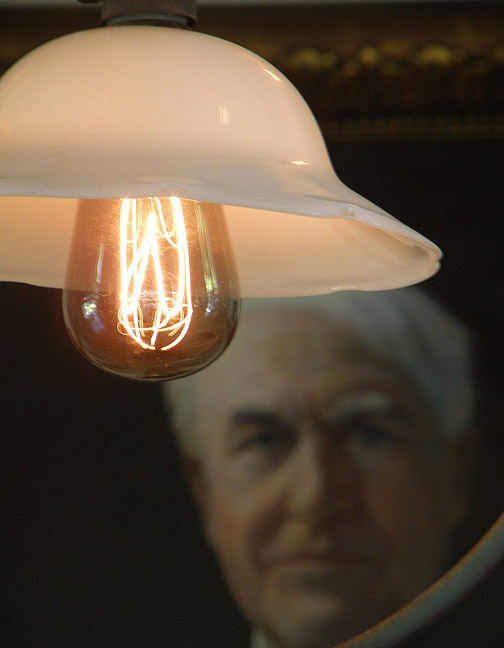 SustainableWork: Thank you Thomas Edison. Happy 2013! Thank you Thomas Edison. Happy 2013! I was fortunate to be able to spend my late Dad's birthday at Thomas Edison's Botanic Research Laboratory in Florida. Mr Edison invented to idea of a dedicated research lab - "set up with the specific purpose of producing constant technological innovation and improvement." He is credited with 1,093 US patents as well as many foreign ones. One of my favorite quotes about how innovation works is from Mr. Edison: "Genius is one percent inspiration, ninety-nine percent perspiration." I took this photo at the Edison and Ford Estates, in the Edison Family library. I think it represents Mr. Edison's vision and execution. While Mr. Edison did not invent the electric light bulb, he was the first to create a commercially viable electric light bulb. It is a wondrous story of dedication, perspiration and the ability to build a smarter future. I was also reading a great new book at the time about Mr. Edison called "Midnight Lunch, 4 Phases of Team Collaboration Success", by Sarah Miller Caldicott, the Great grandniece of Thomas Edison. It's a great read with many insights into Mr. Edison's work and how it can be applied to organizations today. We are using many of these ideas to create and support innovative opportunities in small food processing through our Innovation Kitchen model. We want to run as many experiments as we can in the most efficient ways to create smart, new economic opportunities for food entrepreneurs worldwide. This year is your time to make a contribution, to experiment with new ideas and new enterprises of all kinds. Are you waiting for inspiration? Remember Mr. Edison: "Genius is one percent inspiration, ninety-nine percent perspiration." Thomas Alva Edison at Wikipedia. Quotes above from this entry. Cleveland Crops! - Cleveland rocks!